From beloved family pets to therapy dogs, our adoption animals go on to do great things. Most importantly they give unconditional love to their new families. We love receiving your emails and letters with updates of the dogs and cats who are adopted and adored. 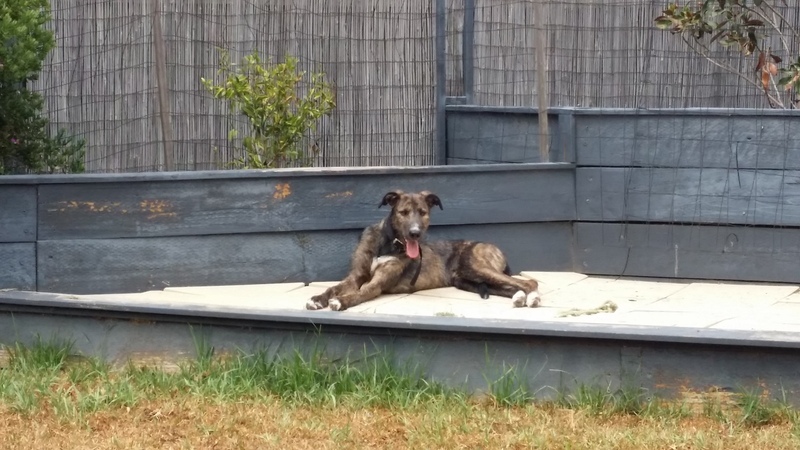 In this edition of Adopted & Adored Amy and Duncan, owners of staghound cross Jed, tell us how he has settled into his new home. We think he has done a great job of settling in with Amy and Duncan. We just wanted to give you an update on our first few weeks home with Luke. Firstly, Luke is now known as Jed. The new name has origins from the first – with our thoughts of Luke being Luke Skywalker, who is a Jedi knight, thus Jed! It took Jed a bit of time to adjust. He spent the first couple of days quietly in a corner; however, he has really started to come out of his shell. Jed and our cat, Arya, got along from the start. She is more than happy to show Jed the ropes, try and teach him what a dog should do and act as a protector when needed. It should be noted that Arya is also a rescue animal and at times can act more like a dog than a cat. Over the last month Jed has been introduced to his two cousins, which has led to a lot of progress. They have been to our house for a few play dates and Jed has visited an enclosed park with them too. 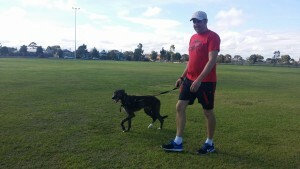 We regularly walk him on lead down to our local footy oval. 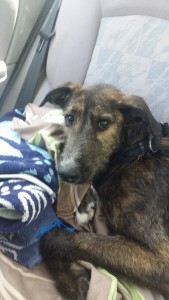 He also had his first fully immersed swim and loves playing with all the dogs he meets along the way. Jed is a very happy dog. His cheeky personality has definitely come through. There have been a few mornings where we have woken up to find Jed has rearranged the furniture, including books, shoes and TV remotes, to the back lawn. He is very happy to show us this achievement! Needless to say, Jed has graduated to sleeping outside in his kennel with plenty of great, interactive toys to rearrange and display at his leisure! He is such a beautiful dog and we love having him as part of our family!